mapme.at WhereDial - Now Shipping! 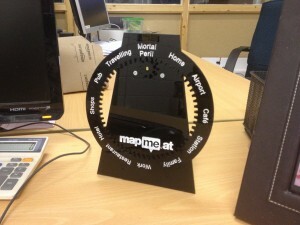 We’re very glad to announce that the mapme.at WhereDial is now ready to start shipping! Want someone to know when you’re arriving at the station so that they can come and get you? Want to let someone know that you’ve made it home safe? The WhereDial connects to your social media accounts via mapme.at and checks your current location, it then turns the dial to read “Home”, “Station” or wherever you happen to be. WhereDials are available for sale starting from just £99 + postage. Click on the items below to see more information about them. Hooks into the full range of services supported by mapme.at, including Foursquare and Google Latitude. 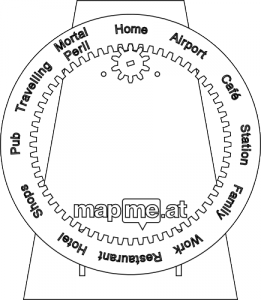 Buying a WhereDial means you’re supporting a great open hardware project. We are releasing the designs for the WhereDial and the software that it runs allowing enterprising makers to suggest improvements and extensions. The WhereDial will ship pre-built and ready to go, you’ll simply need to plug in a power cable and plug an ethernet cable into your broadband modem or router (you’ll need DHCP enabled, most have this). All configuration will be done via the mapme.at website, we’ll even support you with any problems you have via Get Satisfaction. This design of the WhereDial was inspired by Brian Wagner’s Laser Cut Clock, thank you to him for his help and support with the project.